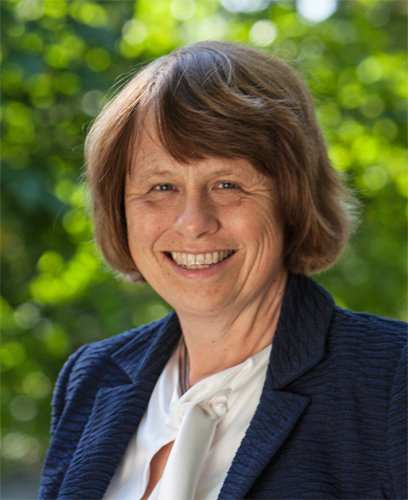 Professor Ewine F van Dishoeck is a Professor of Molecular Astrophysics at Leiden University, the Netherlands, and External Scientific Member of the Max Planck Institute for Extraterrestrial Physics in Garching. She graduated at Leiden University, and held positions at Harvard, Princeton and Caltech from 1984–1990. The research of her group is at the boundary of astronomy, laboratory astrophysics and chemistry and uses ground-based and space-based observatories. The current focus is on the physical and chemical evolution of material from interstellar clouds to planet-forming disks and the importance of molecules as diagnostics of the star-formation process. Professor van Dishoeck holds many national and international science policy functions, including Scientific Director of the Netherlands Research School for Astronomy (NOVA), President-elect of the International Astronomical Union, former member of the ALMA Board and Co-PI of the JWST-MIRI instrument. She has received many prizes, including the 2018 Kavli Prize for Astrophysics, the 2018 James Craig Watson Medal of the US National Academy, the 2015 Albert Einstein World Award of Science, the 2015 Lodewijk Woltjer EAS Prize Lecture and the 2014 Lise Meitner Goteborg Award in Physics, as well as the Dutch Spinoza Award, an ERC Advanced Grant, and the Dutch Academy Prize. She is a Member of the Dutch Royal Academy of Sciences and the Leopoldina German Academy of Sciences, Foreign Associate of the US National Academy of Sciences, and Foreign Member of the American Academy of Arts and Sciences.